Skewville in Bushwick. Photo by Jaime Rojo. Steve Harrington and Jaime Rojo run the Brooklyn Street Art blog, cover street art for the Huffington Post, and have had two of their books about street art published by Prestel. 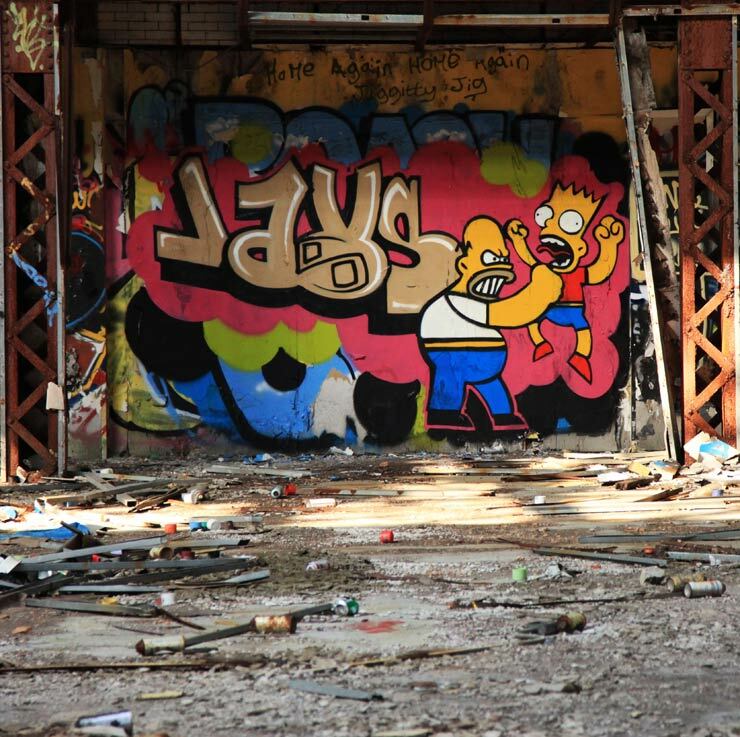 The duo are two of the street art community’s best-loved advocates. Some of their ideas about the internet and street art as expressed in Freed from the Wall, Street Art Travels the World, their chapter of the book Eloquent Vandals, helped to inspire this project, so I asked them some questions about street art, the internet and their work as advocates for the scene. RJ: What has been, in your opinions, the greatest positive change in street art due to the internet? BSA: The internet has made it possible for the artists and the public to have a greater direct, relatively unfiltered relationship to one another. Sharing of images through websites, blogs, and social media have enabled Street Artists to go directly to the audience without the filtering of gatekeepers who got their position through class, education, or silver spoon. A greater share of the public than ever before have an opportunity, albeit virtual, to see new work that they simply would not have had access to ten years earlier. 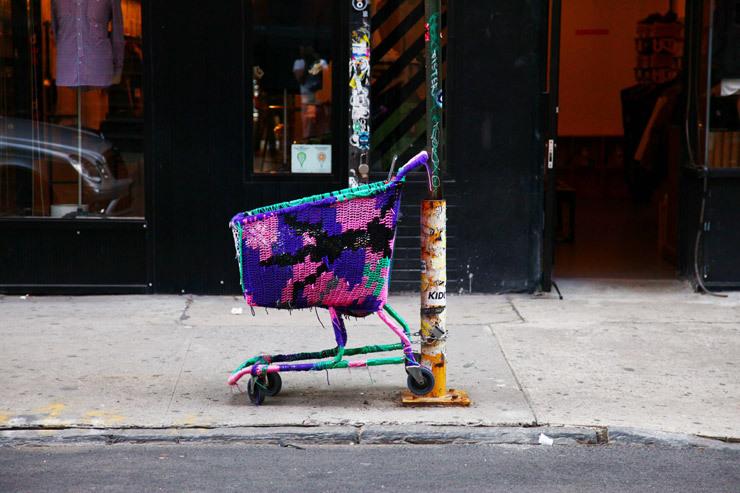 Olek in New York City. Photo by Jaime Rojo. RJ: What has been, in your opinions, the greatest negative change in street art due to the internet? BSA: It’s hard to think of a negative consequence, with the possible exception of the rather explosive growth of work that mimics the good stuff, but that has always been true across creative culture. It just goes faster now. Also there have been more commercial interests weaving their way through the scene, but that is as much a feature of the society and our monetary system as anything else. RJ: Is anything of the actual artwork lost or gained when photographs of street art are taken and posted online, compared to seeing the work in person? BSA: As good as photographic technology is, seeing the piece in real life is always a different experience, and there is value in understanding it in the original habitat. The art that is put on the streets often is contextual and placement is key. Like any other kind of plastic art, Street Art is best when one has the opportunity, luck or luxury to enjoy it in situ. The art itself may not gain anything by photographers taking photos of it. The artist, on the other hand, may. BSA: New and interesting are not always hand in hand, but we see a lot of fresh stuff on the streets every week in New York. Every city has its hot spots for Street Artists to get up, including those walls that get hit daily – we call them magnet walls. But as far as finding it, we’re just like everybody else; get on your bike, go for walks, squeeze through fences, run down railroad tracks, climb up to roofs – that’s how you find it. It helps if you are mobile and rolling and keeping your eyes peeled in neighborhoods or blocks that have been neglected or simply have a higher population of the creative class. We have to scan the city for possible new places and sometime we are lucky and other times we are not. Of course we have a large readership globally so there are always tips from fans and artists, but we still like to discover stuff ourselves. That’s the best! RJ: How did geography play a role in what/who you knew/saw/did with regard to art before street art blogging and photo-sharing became so popular? After? BSA: In the beginning, there was geography. Walking is the primary mode of transportation in New York unlike many other cities, so we really noticed the uptick in Street Art immediately in the late 90s. You might have carried a camera, but most people didn’t so the typical experience was momentary, personal, immediate, and local. After 9/11 when we walked through the streets of our artist-heavy neighborhood of Williamsburg just to clear our heads and try to process the madness, we found that Street Art was also very local, very personal. The things we saw didn’t always feel like they were made for a large audience, just for the one who would discover it. This was shortly before Flickr and blogs took hold, so the scene in this industrial, largely abandoned neighborhood was active but the streets were desolate and there were only a few photographers documenting the art. You could walk for 5 blocks without seeing someone, let alone a photographer. As Jaime continued snapping pictures we just knew that something exciting was happening on the streets and we knew that the most desolate, filthy and interesting neighborhoods were the places to go to find art. 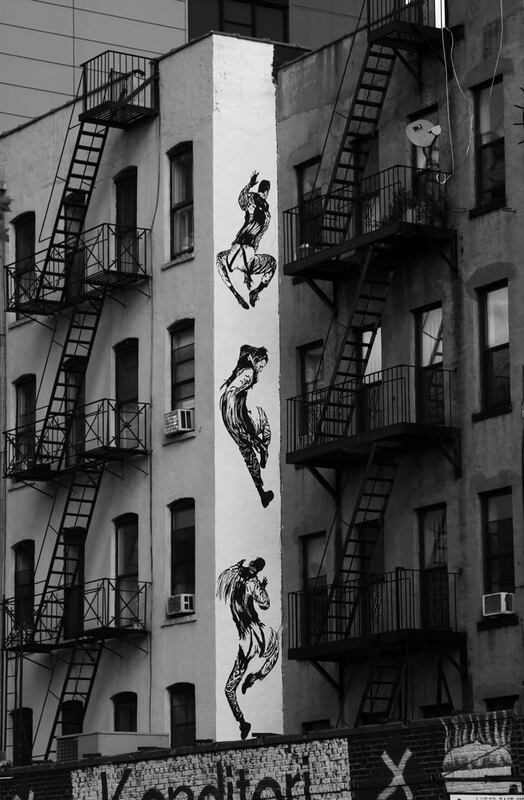 After Flickr fired up and blogging took off, photographers began uploading their stuff and sharing and commenting and with their followers and the very behaviors of Street Artists shifted radically. Suddenly it was as if many became aware that their work could be seen by a huge unknowable audience of people so they courted the “Flickrati” who hit the streets with those new digital cameras with ever higher pixel counts. By virtue of having command of the new technology, the photographers of that period became celebrities of a sort for a while. In reality, the internet blew up the entire game and reorganized roles, rules and peoples priorities. Hot debates flared in the graffiti and Street Art “community” about whether photographers were aiding artists or aiding police in locating and compiling databases of evidence. Others criticized the new phenomena for helping people who had beef in locating your stuff so they could destroy it. Photographers became curators with some voice by selecting and overlooking, collectors began skipping the middleman and contacting artists directly, and artists began marketing directly via the internet and even adding “.com” to their pieces. Obviously, we could write a book about the major importance of the influence of internet in completely unmooring Street Art images from the confines of their physical location, but suffice to say that the sense of “place” has been radically altered over the last decade. JAVS at the Gowanus Batcave in Brooklyn. Photo by Jaime Rojo. RJ: Do you think that street art is ideally free, ephemeral, accessible and illegal? BSA: Yes. That’s the true nature of Street Art. 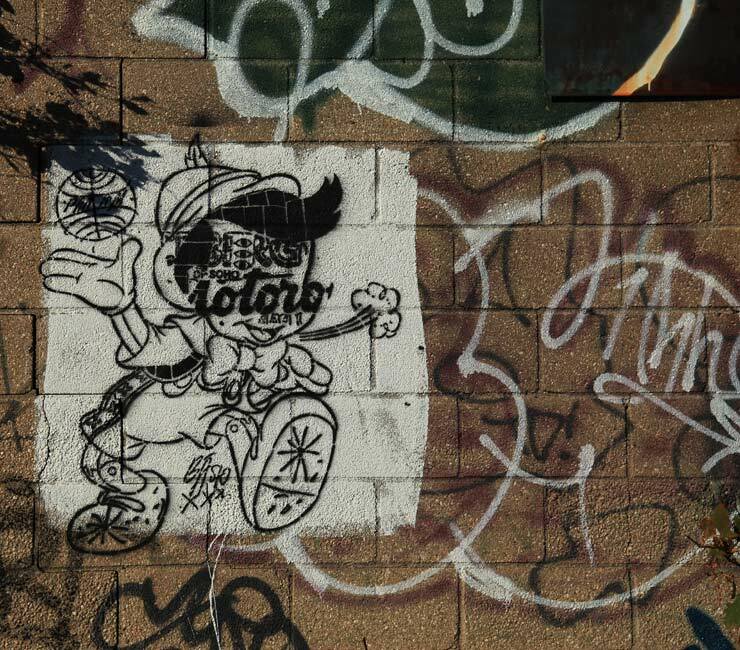 Illegal, while romantic in the disaffected “loner” sense of the word and a driving force for many on the scene, is not entirely necessary for Street Art to be relevant or of value. RJ: Why do you have a blog and how do you use it? BSA: After we published our first book, Brooklyn Street Art in the Spring of 2008, Steve decided to start a blog to promote it. But we couldn’t stop ourselves from talking and shooting and interviewing and asking questions and meeting more and more really interesting people. As artists, we have a deep respect for the creative spirit and an interest in the myriad ways in how it gets expressed. It’s impossible to estimate how much we love having a site where we can share with the rest of the world our passion for art and our interest for Street Art in particular. 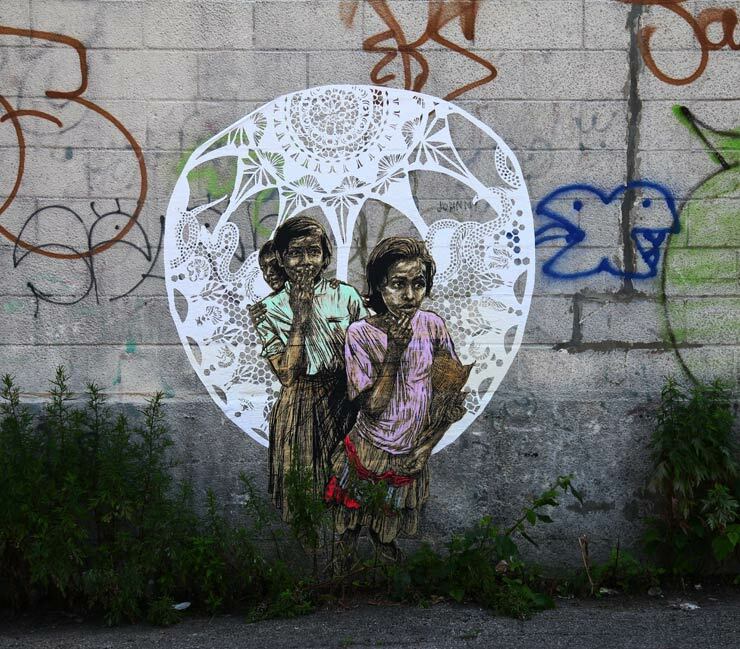 A wheatpaste by Swoon in Brooklyn. Photo by Jaime Rojo. RJ: Why do you take photos of street art and post them online? BSA: We think that BSA, and other sites like it, help promote the culture of art in general and we know for a fact that we have assisted many artists to get more opportunities, meet each other, meet collectors, build their practice and build an audience. We use it as a platform and as a bridge. It is also a way to bring different communities together and to tell young artists in small towns that there are other people in other parts of the globe thinking and doing the same things they are doing, feeling the same stuff they’re feeling. We’ve never found it particularly interesting or valuable to tear people down and this approach has brought a lot of like-minded people our way. Now we take photos of Street Art and post them because we have a site that needs to be fed daily and because we see it as a mission of the site. Sharing online is a way to document this moment on the timeline of a really important explosion of the global creative culture. We think that the seeds for much of tomorrow are right here. We like to share the new ideas and proposals the artists are putting forward with our readers who otherwise would not have any other way of experience Street Art. RJ: Do you know of any cases where posts on BSA or the Huffington Post have led to opportunities for artists? BSA: Yes. Sometimes it’s obvious and direct, other times it’s cumulative for artists. There is now a steady stream of requests from galleries, collectors, art institutions, TV shows, magazines and newspapers that would like to work with the artists whose work we have shown and talked about on BSA or The Huffington Post. Many times we simply forward these requests to the artists and they follow up if interested. Other times we’ve given people their first time in a show, or their first interview, or introduced them to someone, which later helped them to close deals on other opportunities. Not everyone tells us that we have played a role, but we’re gratified to know that we helped many. RJ: Can you imagine blogging about artwork on BSA if the art was intended primarily to be seen by a digital audience? Have you done so? BSA: Perhaps this wouldn’t interest us. We have not done it before. RJ: When did you realize that the internet was affecting street art and graffiti? BSA: When we were doing research for our first little book; Brooklyn Street Art. We realized then that the internet was going to change the way in which artists and public experienced Street Art. Up until then we thought it was just a personal experience. Then we realized that there was an entire digital ecosystem that ever widened. As the blog grew we gradually saw people were becoming more explicit in their contact information and sophisticated in their communications. Some Street Artists are occasionally sanctimonious about their peers dropping the name of their website on their piece, but the truth that is signing your name or your tag is equally effective thanks to powerful “search” technology. In recent years it’s been fun to see fully-formed press releases and newsletters coming from Street Artists who we’ve never once heard of assuring us they are really well known on the New York scene (or LA, Berlin, or Paris). Not that we know everybody – that would be impossible. And we all know of at least one or two Street Artists whose entire practice is predicated on how well the work has been marketed through the internet rather than the more traditional means of, say, doing cool work on the street that gets discovered. RJ: If you were a street artist starting out in this day and age, how would you go about publicizing your work? BSA: First, we would make sure we had actually honed some skills and developed something of relative value or to be fairly interesting. Then, we would put it up a lot. Then we would let other people know about it using all those various means that we all now know about. But the question presupposes that all Street Artists are using their work on the street for the same reason. Some are just figuring things out creatively, using the street as a sketchbook. Some are actually unaware of the “scene” and are just content to interact with the passing public. Others are just doing it on a lark, or deeply in love with somebody, or are in psychological or emotional distress. RJ: Do you ever get contacted by artists who want you to write about their work and get the sense that they view you solely as tools to be manipulated so that they can get publicity? If so, how often and what is that like? BSA: Yes that happens very often. We try to look at the art first and if we like what we see we give it a chance. Still we like for the artists to at least say “hello” first when they send us their work. This is a minimum courtesy, and a nice way to ask someone for a favor. Other times we have simply been ordered by someone who regards us as employees or pawns, an extension of their marketing effort or their PR machine. That’s always entertaining because we don’t make any money from our site and they obviously haven’t done their due diligence. We have our own regular jobs where we need to put up with those behaviors. RJ: Do you prefer to look at street art in person or through photographs? RJ: Are bloggers acting as gatekeepers for street artists in the same way that gallerists and museum directors act as gatekeepers? If so, is the gatekeeping effective or productive? BSA: We don’t see us as gatekeepers. Bloggers and gallerists are a totally different breed. Gallerists are dealers that use the internet to make sales. They usually have a blog as a component of their gallery’s site but that’s different from a Street Art site. We share what attracts us and report on what we see in our features and editorials and interviews. The site has a calendar of events and we use it to inform the readers of shows, art events and art festivals and art fairs. We also use the site to provide free banners to causes and events that we think would benefit from our traffic when we like their mission and goals. Gate-keeping is sadly antiquated and a relic from those days of clubby academic artworld exclusivity – which no one really can respect anymore. Anyone with a computer can start a blog in about 15 minutes. Of course, not everyone has a computer, so in that way there is an element of exclusivity. RJ: Of your all-time favorite pieces of street art, how many have you seen in-person and how many have you only seen photos or video of? 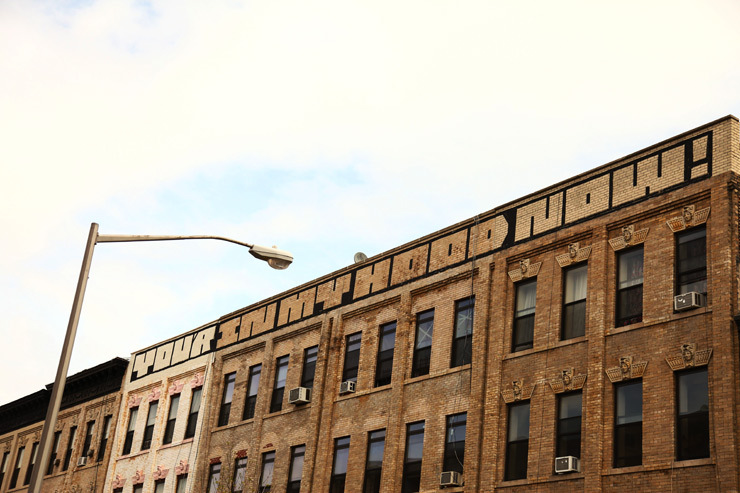 BSA: Most of our favorites in NYC we have seen in person, and we feel really lucky to say so. Globally we depend primarily on other people’s eyes and accounts. A stencil by Bast. Photo by Jaime Rojo. RJ: When did you begin posting things on BSA that did not happen in New York? Why the change? BSA: Street Art is a global art movement so we like to report on it as an integral part of the site as a service to our readers to and help us all understand it a bit better. Since a Street Artist in Brooklyn may easily consider someone in London or LA to be one of his or her fans or peers today, we think we should be just as open to the free exchange of art and ideas. Of course its only from our perspective, we’re no Wikipedia. We began reporting on worldwide Street Art almost since the beginning of BSA, but certainly not as often as now. Now it is kind of part of our DNA. RJ: In Freed from the Wall, Street Art Travels the World, you mention “the plastic nature of Street Art.” What do you mean by that? What do you imagine street art morphing into in the coming years? BSA: Street Art is part of the plastic arts – the ever-stretching morphing blob that reflects us and prods us, and dances past borders. Its unsanctioned nature and accessibility to all levels of society will keep it fresh and challenging, but we all know how money can have a huge impact. The Europeans and the Americas have been always more respectful and embracing of art and Street Art in particular. But in the US, with it’s unquestioning trust of corporations and it’s reverence for capitalism and commercialism more thoroughly pulsing through every thing, you can count on seeing more sneakers and backpacks and “art products” and legal walls and commissioned pieces in the future. The proliferation of Street Art Festivals already is a clear indication of the way we are heading; It seems that there is a new Street Art/Urban Festival every year in a new city. So far, it still feels pretty fresh, and unpredictable. RJ: Is a digital public as legitimate an audience for street art as a physical public, giving the typical goals of most street artists as you understand them? BSA: Yes. Making one more legit than the other would be missing the point. The artists use the streets as a laboratory to experiment with their art and their offerings are for the global audience as much as the local audience. Some times their intentions are commercial but we hesitate to characterize the intentions of every artist – it is a free-for-all out there and they don’t need us to give them labels or permission to do anything. RJ: To what extent are photographers of street art collaborating with the artists whose work they are documenting and redistributing online? BSA: When an artist invites a photographer to tag along on a day or night of putting work up that’s a collaboration. More often however, we would say that the relationship is complementary, since we regard photographers as artists at least as often as they are documentarians. Each player has the capacity to benefit directly and indirectly from the talent and industry of the other. But collaborating in the sense of being on the employ of the artist? No. No self respecting photographer thinks that way any more than a sports photographer thinks Serena Williams is collaborating with him or a White House photographer thinks the president is collaborating with her or a starving head of cattle in an arid land is somehow collaborating. We are recording. We are making art. We are saving a moment in a timeline. WK Interact in the Lower East Side. Photo by Jaime Rojo.